A slate tile countertop can provide you with the matte, rustic appearance of a slate counter at a fraction of the cost of a slab counter. Understanding the types of slate on the market can help you make your choice and decision easier. Slate is a metamorphic stone comprised mainly of sandstone and mud. Formed in layers, slate splits apart naturally at these points, known as clefts. There are several types of slate tiles available on the market today. 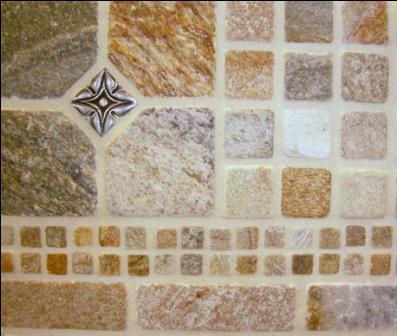 While all of these stones are beautiful, not all of them are going to be suitable for your slate tile countertop. Ungauged slate tiles are formed by roughly cutting the stone into tiles of approximate size and thickness. They can vary as much as 1/4-inch in thickness from tile to tile and within one tile. The surface of ungauged cleft slate is natural with hills, valleys and layers. These layers will flake slightly for three months after installation, as the slate gets used to its new home. This is known as spalling and it can make your installation very dusty for a time. Gauged cleft slate tiles are even in thickness and size, with a natural, cleft face. While they are easier to install than ungauged slate tiles, they are still prone to spalling and will have an uneven surface texture. Gauged honed slate tiles are uniform in size, thickness and surface texture. The tiles have been ground to a flat, matte finish that is perfect for your countertop. The surface will be smooth, the tiles easy to install and the surface of these stones will not spall after installation. Slate tiles can come in a wide range of colors. You can choose from flat black or green slates, similar in color to those used on black boards, or you can choose slates which will vary dramatically in color from piece to piece. All slates can be purchased in a gauged, honed finish although some may need to be cut to order. When selecting your slate tiles, consider the rest of your kitchen design. Choose solid colored tiles if you are planning on installing a colorful backsplash, have a lot of other details in the kitchen or are looking for a sedate design. Choose variegated slate tiles if you wish your countertop to be a focus in the kitchen design. Tuscan kitchen designs, rustic homes and homes with eclectic design and lots of color will work well with a multi-colored slate countertop. If you are considering using slate tiles for your kitchen countertop in the place of a slab or another counter material, consider both the pros and the cons of using this product when making your choice. A slate tile countertop can do a lot to enhance your kitchen design. Make sure you choose the right type of slate for your design and your kitchen's use and know that you will have a beautiful counter that can withstand years of use.